President Donald Trump recently highlighted the importance of our “Western tradition”—meaning the foundation of Western Civilization—in a speech he gave to the people of Poland. The mainstream media took issue with the phrase “Western tradition,” accusing him of promoting an “alt-right manifesto” that only celebrates dead white men. While the media always reacts strongly to anything Trump says, this particular response shows there is a great misunderstanding among the general public about the meaning of Western heritage and its foundations. The truth is, you cannot call yourself educated unless you know the history of Western Civilization. That is why Hillsdale College is offering a free online course titled “Western Heritage.” It is based on a class that everyone at Hillsdale College must take in order to graduate. Participants in this not-for-credit online course will become acquainted with the historical roots of Western civilization, in particular the ways in which modern people are indebted to Greco-Roman culture and the Judeo-Christian religious tradition. You can download audio-only versions of the Western Heritage lectures, but Hillsdale does not offer DVD copies of these lectures for distribution or sale. The course is entirely online. Lectures, primary documents, and other study materials are all available to view online at your convenience. Once you have completed all ten sections of this course, you may take the Final Quiz in order to receive a “Certificate of Completion.” After completing the Final Quiz with a score of at least 80%, you will receive a certificate in the mail within four to six weeks. This certificate is not a diploma, and there is no transferable academic college credit offered for completing this course, but it’s fine to list it on your homeschool transcript. Please encourage your friends, family, and anyone else you think may be interested in taking this course to register and begin their studies. 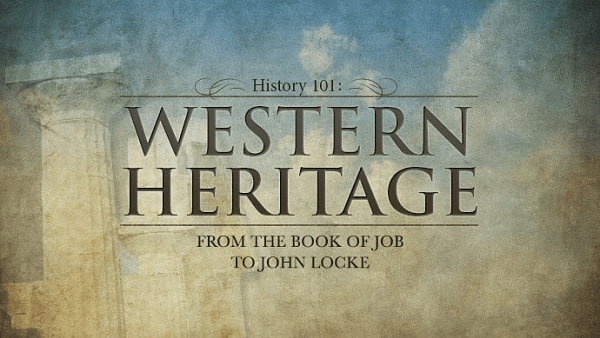 NOTE: Reading assignments for this course are drawn from Hillsdale’s publication, Western Heritage: A Reader, and are provided free-of-charge through the course website. You may also purchase your own copy of the book at Amazon.